Ladies, I'm just a little excited about this giveaway... SO many fun goodies!! The giveaway closes at 12:00AM EST on April 9th. The winner will be announced the following day and contacted via email. I think I'd be most excited about the gift card, but I'm also super intrigued by the lip lacquer! Can't decide between the J.Crew necklaces or the gift card to Anthropologie! Such a fantastic giveaway! I am excited for all of it, but especially the chocolates and Anthro gift card! :) How fun! Love the necklaces! So cute. I love seeing your blog pop up on my reader! Love the necklaces and definitely the gift card!!!! With my unhealthy obsession of statement necklaces, I'm definitely excited about those two! They are perfect for layering or just wearing on their own. The J.Crew necklaces are definitely my favorite! What a great all around giveaway! I am loving the burgundy necklace, so pretty! The Fresh Seaberry Moisturizing Face Oil...I love trying new skincare brands! The beauty blender cleanser. I also happen to need some. Bad! Best giveaway ever. My favorite item has got to be the J Crew necklace on the left!!! Oh man, my heart. Love the necklaces! hope I win..
My favorite is the JCrew jewels. Thank you so much for offering such a lovely and generous giveaway. 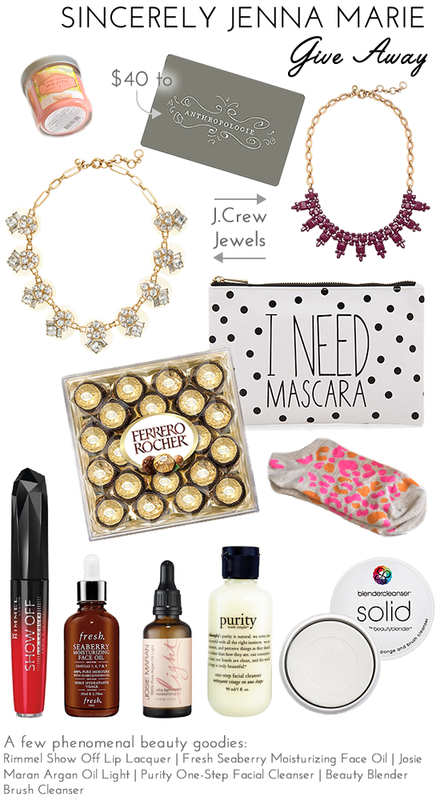 My favorites are the Josie Maran Argan Oil Light, $40 to Anthropologie, and Ferrero Rocher chocolates. J. Crew necklaces are my fave. Obvi. But the anthro giftcard is a close second! Also I've never cleaned my brushes so maybe my most-needed item is that cleanser stuff? The clear J. Crew necklace is my favorite but I would not spend the money on the candle so that would be pretty nice to get! Oh that's a hard decision choosing a favorite. I guess I will say the Anthropology gift card, but I love the necklaces and I also love candles and chocalate, oh it's tough choosing. I so hope I win as I'm sure everyone does. Thank you so much. I'm excited for the Mac & Cheese. Wait... nevermind. MORE VIDEOS. Mainly of you walking around with your dog. Thx. the anthro card and the Argan Oil! My favorites are the the Anthropology gift card and The Rimmel Show off Lip Lacquer! I just started following you on IG and I'm loving it! I think my favorite would be the necklaces! I would love to try all the beauty products listed especially the red lip lacquer! I've been searching for the perfect red forever! Love your blog and IG!! Love your list! Thanks for the chance to win! The two necklaces and the Antro gift card are what I have my eyes set on :) thanks for a great giveaway! I also, like you, am a huge J Crew and Madewell fan, the necklaces you genorously chose to include are perfect for layering with a classic tee or button down! I love the power of social media and am so happy that I found you via Instagram! Your style is very elegant and sophisticated and it shows through your blog as well. I love any excuse to go shopping at Anthropologie! Love the anthro gift card! 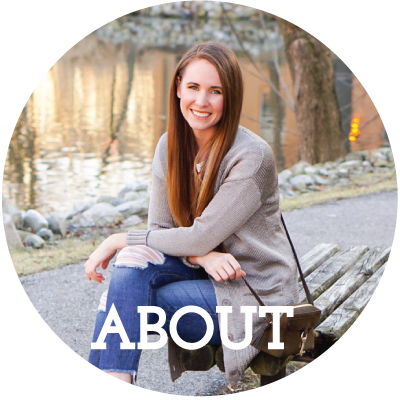 My favorite item is the Anthropologie gift card! I love the J Crew Necklaces!